B. W. Lewis Bros. of Glasgow, Missouri, writes Governor Thomas Carney of Topeka, Kansas, concerning its plan to send emancipated slaves to Kansas. The letter claims a high number of slaves are escaping their masters and are only recovered at considerable expense. 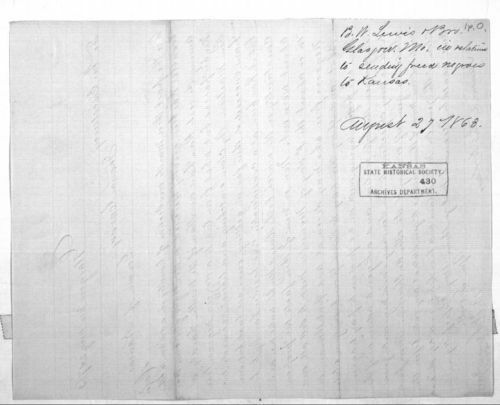 The firm outlines a plan to free its slaves by November 1, 1863 and send them to Kansas by boat. The letter asks Governor Carney if he is aware of any objections to this plan. The letter claims that most of the slaves near Glasgow will have escaped to Kansas by year's end. President Abraham Lincoln's Emancipation Proclamation, which freed slaves in areas controlled by Confederate forces, became effective January 1, 1863. As a Union slave state, Missouri was not legally affected by the proclamation. Creator: B. W. Lewis Bros.